SJMC students and staff were honored by the Wisconsin Broadcasters Association at their Student Seminar on Saturday, Feb. 24, for their exemplar work produced both in the J-School and in various student organizations on campus. 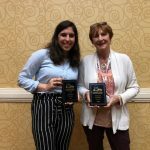 The WBA announced the winners of their Wisconsin Foundation Scholarships and revealed the list of winners for the WBA Student Awards for Excellence during the seminar held at the Marriott West in Middleton. Faculty Associate Pat Hastings and student Aleesa Kuznetsoy attended the seminar to accept the award for first place in the Best Newscast category for their work on “The Badger Report.” The Badger Report is a weekly live streamed newscast that appears on YouTube and is created with the help of Wisconsin Public Television. Meanwhile, Steven Potter, an SJMC graduate student, was awarded first and third place in the Audio Storytelling-Sound (Radio) category for his work on Beats on Campus and My Life as Isaac’s Dad. Potter was also one of four students awarded the Wisconsin Foundation Scholarship. The scholarship recognizes Potter for his current studies in broadcasting in Wisconsin. After he receives his master’s degree in journalism from UW-Madison, Potter hopes to become a multimedia reporter at a major news outlet and focus on investigative pieces and features on emerging trends. Two websites were honored in the website category. The Badger Report’s website, which serves as a companion website for the weekly newscast, took second place. Meanwhile, Curb Magazine, a product of the magazine journalism course taught by Stacy Forster, was recognized for their website in third place. Daniella Byck and Karolina Barej took first and third place respectively in the Audio Podcast category. Byck was recognized for her podcast, Farm to Table and Barej for When We Spark. Both podcasts were created in Journalism 475 Storytelling through Sound. The WBA also recognized three other SJMC students for their work in television for stories produced as part of the Badger Report. Amos Mayberry took third in the TV News Story category for his story, Soil Pollution Lawsuit, which was created in the Video Journalism course in the J-School. In the TV News Feature category, Jacob Swanson took second place with his story about thousands of cranes that settle in Baraboo, Wisconsin each year. Olivia Bruce, who graduated from the SJMC in 2017, was awarded second place in the TV News Documentary category for her final documentary project on the Bucky Bucket List. SJMC student Robbie Heimbruch was recognized for his work in sports journalism. He placed third in the TV Sports category with “Occupaws,” a story on the Badger Women’s Hockey team, and first in Sports: Non-Play by Play with Press Pass, which looks at the Wisconsin football team during the third week of their season. The University of Wisconsin-Madison’s School of Journalism and Mass Communication picked up a total of 18 WBA Student Awards for Excellence ranging in category from TV and radio to websites and social media. The full list of the 2018 Student Awards for Excellence Winners from the WBA can be found here.